Ever tried biking underwater? Aqua Spin is a super fun and low-impact workout that uses the water resistance to push your body and burn calories. You can sign up for a class at the Intercontinental Hotel Dubai Marina’s rooftop pool, overlooking the Marina skyline. Fancy working out for free? 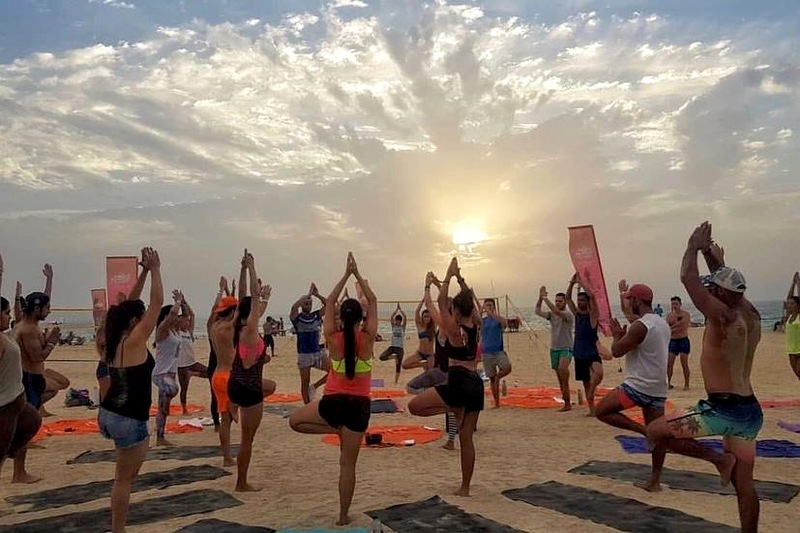 The Project DXB is holding free bootcamps on the beach every month, and everyone’s invited to join in! The classes are totally free to attend, but booking is essential. Calling all yogis! Don’t miss the free evening yoga classes at Skydive Dubai throughout the week. Everyone is welcome to join, and no prior experience is needed. Just bring a mat (if you have one) and a bottle of water with you, and enjoy the class. Fancy soaking up some sun this winter? Sign up for a fun stand up paddle boarding class at the beach, followed by a healthy breakfast at Park House. Check out their FB page for more events, they even hold sunset yoga & circuit classes. Whether you’re getting ready to take on the du Tough Mudder or XDubai Spartan Race, or you’re just looking for an insane workout – you need to check out this free obstacle course training class in Dubai! Think you can handle it? Anthony and Monika will take you through a circuit-style obstacle course, and it won’t be easy. Ready to unleash your inner monkeys? Every Friday, everyone is invited to try out a super fun acro yoga class in the park! Bring a friend along for double the fun. previousAre These The Coolest Water Exercises in the Middle East?